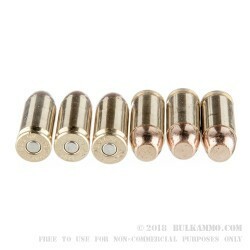 A special kind of feeling comes over a shooter when they can go to the range and just know that they won’t be bothered by a broken part, or a bunch of feeding difficulties, or bad accuracy. 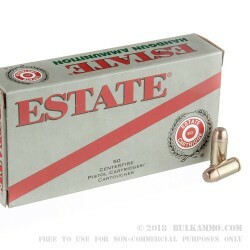 Estate seems poised to be producing this kind of peace of mind for shooters who can embrace the top-quality ammunition that happens to be competitively priced. Estate has a heritage that few people realize, but which makes their production facilities and protocols nearly unbeatable. They are a brand that fits right in with their sister organizations which include Federal and Speer; CCI and American Eagle. 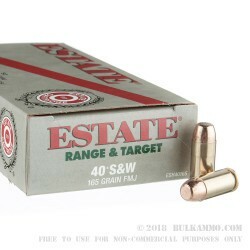 Estate has delivered on shooter’s needs with this simple, straightforward load for the .40 Smith & Wesson shooters that want that midrange 165 grain projectile in a full metal jacket configuration. This is an impressive load for those who want to simply put some holes on the paper or test for functionality. 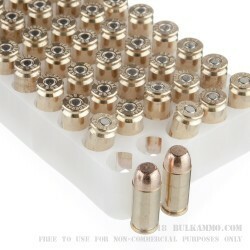 The reliability is very high, and the reloadable casing with its Boxer primer and the low price that allows this to be used effectively as a donor cartridge, and still provide flawless performance while getting through the first loading.